As with any project, our first priority is to deliver without compromise. emagine’s delivery model is there to contribute to this goal and we remain committed to delivering superior services at a more manageable cost, whilst continuing to offer the best and most beneficial services to our customers. Our experts are amongst the top 10 % in our market, combining first-class experience with specialised knowledge in the financial services sector. This enables emagine to help shape the future of finance. Our practice-based organisational structure, combined with our agile Onshore Delivery Model, allows us to best match the skills of our consultants with our clients' specific project requirements. 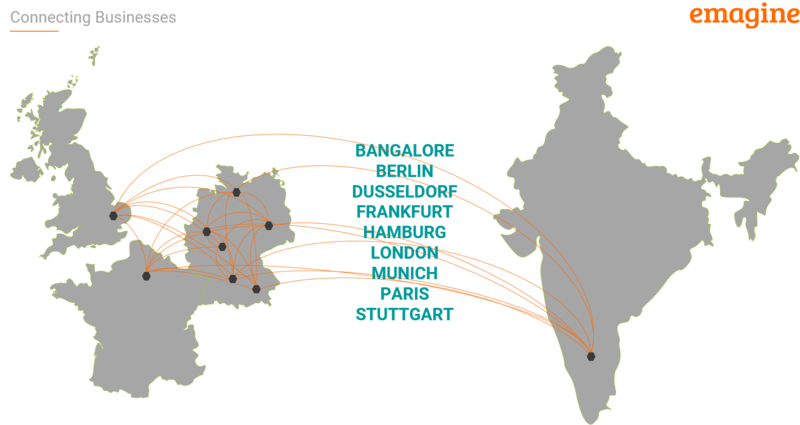 Our Onshore practices are improved by our IT Offshore Centre of Excellence, which is based in Bengaluru - India’s “Silicon Valley”. Our Offshore Team consists of extremely qualified IT masters – all of whom are Senior Consultants with specialised experience at large investment banks. Their advanced technical know-how and overall expertise range from Application Development through to Application Testing and Support. The control of the client project remains on site. By pooling our skills, experience and innovative thought patterns across international borders, we are able to create and offer excellent opportunities and services to our clients’ businesses.